Company owner sees van explode outside his home. 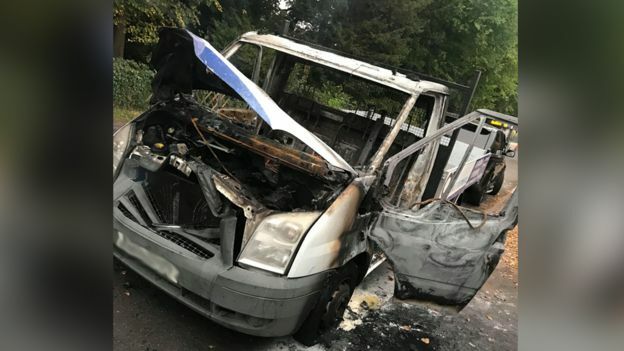 The owner of a demolition firm whose work van was set on fire outside his home has said he feels “numb” after the suspected arson. Kieran Cowley, 24, who runs Cowley Environmental in Oakley, Bedfordshire, believes the attack, at about 23:15 BST on Thursday, was deliberate. He claimed someone wanted to “tarnish” his two-year-old company, which he said had a million-pound turnover. Bedfordshire Police is treating the fire, on Church Lane, as suspicious. This i not the first time that a UK demolition company has fallen victim to an arson attack. AR Demolition, based not a million miles away in Leicestershire, suffered the same fate twice: first in January 2015; then again in March 2017. Posted: October 7th, 2018 under News.